The Long Course is for experienced racers, those wishing to utilize race-specific watercraft, or those just looking for a little extra challenge! Double the Distance, Double the Fun! The 9 mile Long Course starts at the Riverbrook RV and Campground off route 25 in Rumney (red line). 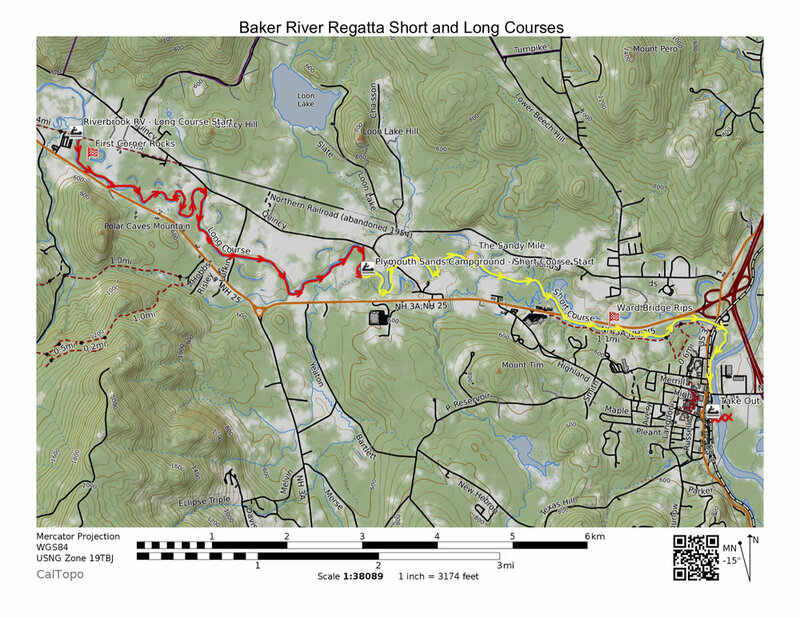 From the start in the large pool above the old RR bridge, the course runs 4.5 miles downriver to the Plymouth Sands Campground where it joins up with the Short Course (yellow line). This section of the river has lots of tight corners, a few very small rapids, and a couple of stretches of shallows (especially in low water conditions under 250cfs). The water is consistently quick throughout. There are also several woody snags throughout the course, all easily avoidable by paddlers with average skill. For experienced canoe and kayak racers there are great opportunities for practicing boat handling and race tactics. The Long Course will use a mass start (or “mass by class” if numbers are large) to provide the best racing experience. If you are an experienced paddle racer, or you are just looking for a little extra challenge, the Long Course is for you! Expected times for paddlers of the long course are between 70 and 100 minutes. This is also the course for paddlers wishing to utilize race-specific watercraft. Flatwater racing boats adhering to current USCA rules, and downriver racing boats adhering to ACA rules are welcome. Recreational craft are also still allowed. Best Costume: Use your imagination!